May I introduce myself? My name is Dean Kenneth Horatio Geovanni Gnome, aka "Deano". 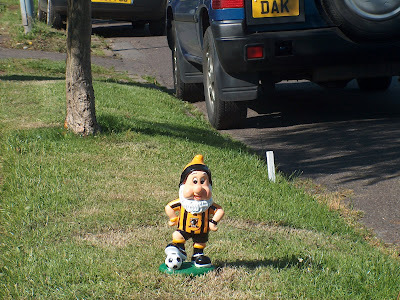 On Sunday, I was liberated from the Hull City supporters' store and brought here to the Pudding Towers Estate - home to Lord and Lady Pudding. This sunny May afternoon, as their highnesses were away at work, I thought it was time to do a little exploring. Mmm...what's this the lord and lady are growing up the garden? Looks like butternut squash to me! How pretentious! Why can't they just stick to spuds and turnips? Hello! Hello! What have we got here then? 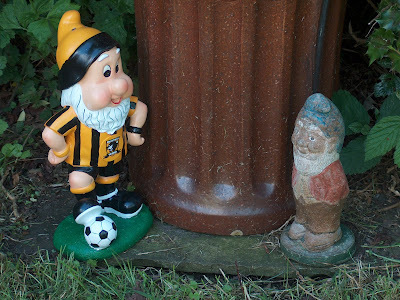 This gnome is as old as the hills. I tried to kick the ball to him but he just stood there like a statue. Cheer up grandad! In the greenhouse I met more gnomes. The old guy on the left is American - says his name is Brague. The other one is Yorkshire from Richmond...called Alfred, Albert or Arthur...one of them daft old-fashioned names they used to have in the nineteen thirties. Grumpy old gits. They've been out in the sun too long. No wonder they're locked up in the greenhouse with the tomato plants. In the house now. Thought I'd check out the washing machine. It was like being inside a space capsule or perhaps a deep sea diving bell. Thank heavens the mistress didn't come in and press the start button. That's me at the front of the house waiting for their worships to reappear in their Roller. Guess I might as well have a kickabout with the locals. Over here son! On me head! If Daphne up in Leeds can blog about drystone walls then so can I. Actually, I first wrote admiringly about them just over a year ago. The pictures above and below this paragraph were snapped by yours truly on Blacka Moor just south of Sheffield. Here the wall builders of long ago used millstone grit and hard sandstone from the local area. That's how our country's precious network of drystone walls was created - using locally sourced stone. Hence in the Cotswolds the walls are honey-coloured whereas in the White Peak of Derbyshire ash-white limestone was used. Many is the time I have stood in awed silence, admiring long dead wallbuilders' craftsmanship - the way the stones fit so snugly and naturally together even though every single stone used is slightly different from the next. And I love the way, nature embellishes the rustic beauty of these walls - lichens and ferns and creeping plants. They are lovely to behold. 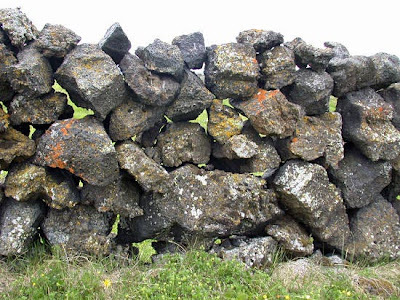 On a recent walk by Blacka Moor, I noticed how a wealthy farmer has had more than fifty yards of brand new drystone walling created at the side of the public right of way. It looks great and must have cost him a pretty penny to have built. Historically, farmers and their hired labourers would simply and patiently create their own walls. That happened quite literally through a thousand years and more of English history. Nowadays it's more likely you'll find a drystone waller in the yellow pages, phone him up and get a hefty estimate when he turns up in his Land Rover. 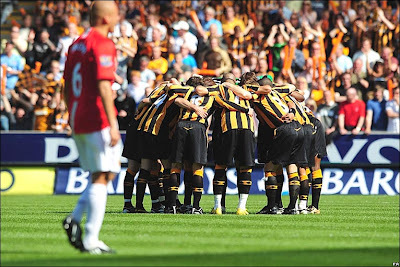 The Tigers huddle before kick off. It was May 24th, 2008 - a year ago. Pathetic as this might seem to non-football supporters, it was one of the happiest days of my life - alongside our wedding day, the days on which our children were born, being selected for Hull schoolboys rugby team, seeing Jimi Hendrix live at The Isle of Wight Festival. 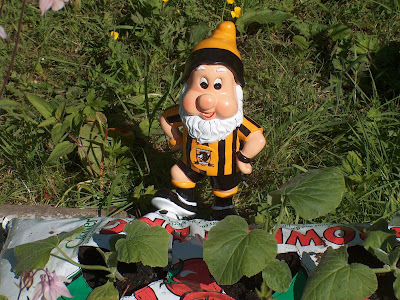 Yes it was so happy, Hull City's victory in the Championship play off final to join the top flight of English football for the very first time. It was a day I had often dreamt of but never believed would happen and a day when I discovered the meaning of "tears of joy". They were streaming down my cheeks. So a year has passed. The Tigers began their Premiership adventure so brilliantly, gaining unexpected victories at Arsenal, Newcastle and Tottenham. We drew at Chelsea and Liverpool and lost narrowly to Manchester United in a seven goal thriller. Okay there were bad days at the office - the heavy defeats to Wigan and Manchester City spring to mind - but our lads got up, dusted themselves down and came back fighting against the odds. Since Christmas we have been in freefall, lady luck deserting us almost entirely. There were games when you shook your head in sheer disbelief wondering how on earth we had again failed to win a point or three. So it all boiled down to the last games of the season. We were playing Manchester United's reserve team and Newcastle were at Aston Villa. This was "Survival Sunday". Rocking like an in-patient in an asylum and muttering "Oh God" over and over I watched in agony as we again managed to go down to an undeserved one-nil home defeat thanks to a superstrike from United's Darron Gibson. Over in Birmingham, Newcastle's Damien Duff cleverly deflected a long range Villa shot into his own net. Middlesborough didn't manage a miracle at West Ham so they go down with Newcastle and The Tigers live to fight another day. Another season in The Premiership! Amazing! I wouldn't say I was happy yesterday - just mightily relieved and Lord knows our management team will have to pull out all the stops to strengthen the squad this summer. Getting rid of some fringe players would also help. 2008-2009 has been a fantastic roller coaster ride of ups and downs, highs and lows. I wouldn't have missed it for the world. You might say that there are more important things in life than football but I might disagree. 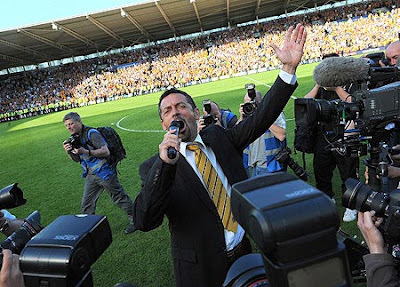 Charismatic Hull manager Brown serenades the crowd - "This is the best trip I've ever been on..." to the tune of "Sloop John B"
Down at the pub, there was a poster in the window - "Survival Sunday". Are we talking about starving children or the aftermath of the swine flu pandemic, motorway mayhem or widespread flooding? No! It's far more important than that. It's the question of who will be relegated from the English Premiership. 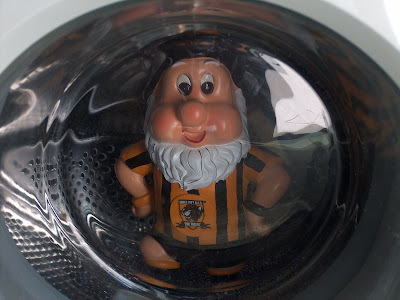 It took my team - Hull City - 105 years to finally get there and earlier this season there seemed to be no chance of us being down at the bottom facing the drop on the final day of the season. But there we are and all we have to do is to win our final game to guarantee safety. Who are we playing? Why none other than that little north west pub team called Manchester United! You may have heard of them. They will be playing Barcelona next Wednesday in the European Champions League final! 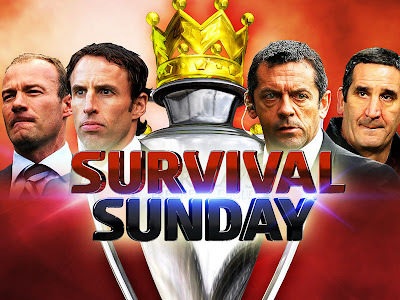 May I humbly ask all bloggers out there to keep their fingers, toes, legs and other bodily protuberances firmly crossed between 4pm and 6pm this Sunday evening? Also if you are of a religious persuasion please pray for our lads. We dared to dream, we have lived the dream but we want to live that dream for another year. For Jesus Christ's sake....Amen. 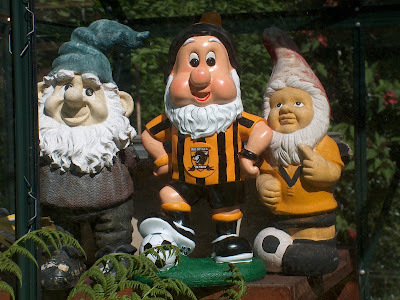 COME ON YOU HULL! Managers - Shearer, Southgate, Sir Phil Brown (City) and Sbregia. On one of my recent weekly shopping trips to "Netto", I was perusing the random phantasmagorical collection of consumer goods in the central aisle when I came across a pack of dish cloths made from bamboo! Yes, bamboo! Obviously they had been processed and woven but they are almost 100% bamboo and they wash our dishes very nicely. Bamboo is quite an amazing plant. There are many different varieties and you can do lots of things with it. You can, like a panda, eat it. You can make drinking vessels from it and even knives. Musical instruments - drums and flutes. Rafts and poles to punt the rafts along. Fences, woven floor mats, baskets, containers for steaming food in, hula hoops, canes for runner beans, table mats... Its usefulness must surely outdo the very adaptable coconut palm. 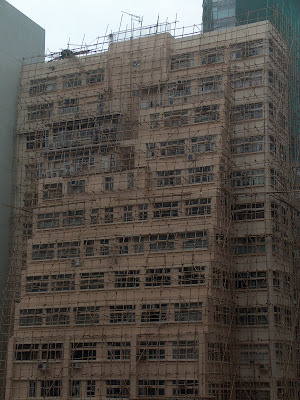 In Macau, we saw a Chinese theatre's vast marquee erected near the Maritime Museum. When I pulled back the gaudy canvas and peeped inside - I could hardly believe it. The whole internal framework was constructed entirely of bamboo and this marquee could have easily accommodated five hundred people as well as a full size stage. The DHSS have paid out many thousands of pounds for a TV ad campaign that has the end slogan "We're Targeting Benefit Fraud". There are dark shadows and slightly threatening music as a spotlight scans our cities, seeking out the cheats and the scroungers. Much as I detest any form of dishonesty, I find this campaign a bit rich in the light of what we now know about busloads of our politicians. Talk about pigs and troughs. Expenses? Good lord, as a teacher you find that the bureaucracy and form-filling that you are required to do in order to claim legitimate expenses is like an insurmountable barrier so you just don't bother. I drove to Birmingham for a work related course last September and I didn't claim a single penny. Yesterday, a colleague went to a stationery shop in her spare time and bought highlighter pens for her classes with no intention whatsoever of seeking reimbursement. But our servants in parliament, they have claimed for food bills, shelving units, moat cleaning, designer decoration, mortgages they didn't have, beds, bedding, hanging baskets, first class travel around the world, mock tudor beams, court summonses. The list goes on and on. And greedily they even "flip" first and second homes in order to milk more from the system. 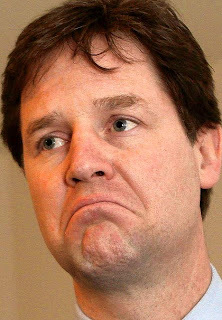 Take our local MP, The Right Dishonourable Nick Clegg, dull as ditch water and leader of the so-called Liberal Democrats. There he is on television, all moralistic and shocked, talking about purging Westminster of its sinners. Yet he is just the same as the rest. Here in Sheffield, at the taxpayers' expense, he hired a gardener to maintain the land around his rarely visited constituency home. £260 a month for four hours work a week. Clegg grunted that he was doing the taxpayer a big favour because it was important for him to maintain the property to a good standard - thereby protecting national interest. What poppycock! Why couldn't he do what the rest of us do - get outside with our lawnmowers, clippers and brushes and if too busy or lazy to do the work then pay for a bloody gardener from your own pocket! The whole thing is an absolute disgrace. I have voted in every election I could vote in since I turned eighteen... and always Labour - for socialism - or the tantalising idea of socialism - runs through my very bloodstream. But next time? Who is there to vote for? They're all the same. They may begin with good intentions - like the animals of Orwell's farm - but in the end they transmogrify into the very figures they pledged they would never become. grew up with his Aunt Mimi and Uncle George." Of course, Dylan met Lennon in his lifetime and who knows how close they got. I once went on a Beatles Magical Mystery tour in Liverpool myself, seeing the same semi that Dylan saw along with Strawberry Fields and several nondescript houses where Paul Mc Cartney lived. I recall the tour guide announcing, as we passed the Job Cente in Speke... "And that's where Pete Best works..." Of course, he was The Beatles' drummer before Ringo Starr. Dylan as a tourist and allegedly nobody recognised him but perhaps they were simply being polite to give the guy some well-deserved private space. 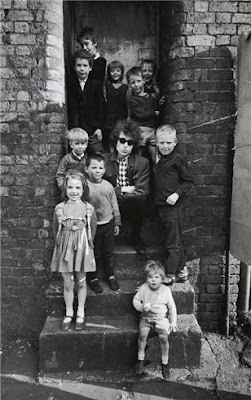 When I visited Hibbing, Minnesota some years back I had almost given up hope of finding Dylan's childhood home until we stopped at a bar on the way out of town and the barman said he knew. Strange how we can all be so curious about where our musical, artistic and literary heroes once lived. Please give me your thoughts. I first worked in classrooms at the age of sixteen as an unpaid teaching assistant in the local village primary school. After my A levels, I signed up with Voluntary Service Overseas who jetted me off to the Fiji Islands at the tender age of eighteen to spend a memorable year teaching English, History and Geography at the high school on the remote island of Rotuma. Then it was back to Britain and straight up to the University of Stirling where, after four years, I gained an honours degree in English Studies with Education having undertaken teaching practices in a range of schools including St Mungo's Academy in Alloa and Alva Academy. I could have stayed in Scotland but I preferred to get back to England. My career hasn't been what you might call meteoric. Over thirty two years, I have taught in just three South Yorkshire schools and for the last fifteen years have been Head of English in my present school. I have been Mr Dependable - never absent, always there, meeting the deadlines, supporting younger colleagues, oiling the wheels. Septembers have come and gone. The conveyor belt in the sausage factory has kept turning. I have given so much of myself, seen so many children and so many teachers come and go...to a point when I am now, in terms of years of service, the longest serving teacher in the school. How did that happen? I decided some time ago that this academic year would be my last at that school. I just couldn't see myself there at sixty. It would have killed me. I have earned a reasonable pension package -albeit slightly reduced - but it would be easy enough to sign up for another school and put another couple of years in without the intense pressure and scrutiny associated with leadership and management. In fact I saw such a post advertised ten days ago in a school that is much higher up the league table. But do I really want that daily grind any more? Lessons to plan, books to mark, behaviour incidents to challenge and report, deadlines to meet, spreadsheets to fill. Late nights and lost weekends. The emotional toll. It would help the family moneypot that's for sure but we're okay - no mortgage, some savings, the kids pretty much grown up. What could I do instead? I could polish up my writings - plays and stories aimed at mid-teenagers. I could design and make mosaics. Return to song-writing and painting. I could sign up to be a temporary supply teacher - just to bring in extra money. Re-establish our vegetable plot. Make a pond. Get fitter. Travel some more - Guyana, Tuvalu, The Leeward Islands, keeping New Zealand for later when Shirley's able to commit six weeks. I guess that the dilemma that faces me is one which thousands of people in less comfortable circumstances would envy but as the end of twenty three years at my present workplace approaches, I feel a growing sense of apprehension laced with uncertainty. How do you think I should move forward? Continuing reflections on my blogging name, let's think of it as a verb. 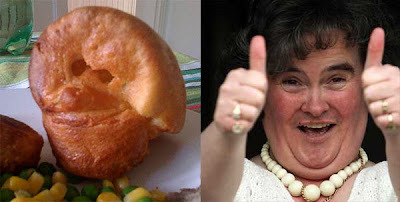 To Yorkshire pudding someone could have different meanings. It might mean delivering a right hook to an annoying fellow's chin, sneaking into a parking place or amorously snogging a gasping lady under the wisteria. As an adjective - "The model wore a glamorous tailored dress in Yorkshire pudding gold" or "The family lived a Yorkshire pudding life in keeping with northern traditions". As an adverb - "Yorkshire puddingly, he rose to answer the door" or "She drove Yorkshire puddingly, obeying each law in the Highway Code". Bank Holiday Monday and surprise, surprise, after a lovely late springtime weekend there's thin grey drizzle in the air. What to do? Shirley's forever grafting away at one of her assignments - she's going for an advanced nursing degree. Yesterday I assaulted the garden after taking our son Ian down to the home improvements temple they call IKEA near Nottingham so today - what to do? I know. 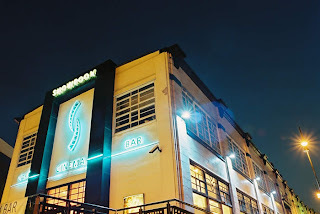 The cinema! Haven't been in ages. I decided to get some exercise and set off at a cracking pace on the two mile walk into Sheffield city centre. It's nice to walk through cities - leaving the car behind. You see so much more - some of the little nuances of people's lives - unexpected vistas, a man from a magazine ad on his mobile phone at the top of one of those blocks of designer flats they keep throwing up - you know all glass with stainless steel handrails and potted palms. He looked so cool up there in his designer life. At the Salvation Army Citadel on leafy Psalter Lane I noticed their motto for the first time - "Blood and Fire" - the blood that Jesus spilt and the fire of the holy spirit. Past the Chinese Fireworks centre ("You will be clamped!") and the Thai Buna restaurant in the old bank and over St Mary's Gate dual carriageway, missing Staples car park then past the site of the Gatecrasher nightclub fire and on towards The Showroom - Sheffield's main independent cinema. "One for 'The Damned United' please!" It's a British made film directed by Tom Hooper and based on the factional novel of the same name by David Peace. I read it last year. It considers a short period in the managerial career of the legendary Brian Clough - when in 1974 he joined Leeds United for forty four short days. The talented character actor Michael Sheen who played Clough was quite brilliant and well supported by Timothy Spall as Peter Taylor. Some visitors to this blog may have never heard of Brian Clough. He was something of a genius in the world of football management - charismatic, unpredictable and utterly passionate about the game. He waved a magic wand over Hartlepool, then Derby County and finally over Nottingham Forest with whom he won the European Cup twice. An absolutely astonishing feat - literally like David overcoming numerous Goliaths of the European game. He was the mastermind behind that incredible and repeated success. But at Leeds United, everything went wrong - it was such a tall order to maintain Don Revie's success there and Clough met with great resistance so he walked. I enjoyed the film but the book portrayed Clough's devilish psychology and lonely genius more darkly and more convincingly. Then it was out into the fine drizzle again. I thought of catching a bus but opted to walk the two miles back - good exercise - this time along trendy Ecclesall Road with its array of coffee shops. What did we ever do before coffee shops came along and are/were they a symbol of the affluence and inflated economic self-confidence of the early part of this decade? I see myself reflected in the Starbuck's window, then "Coffee Revolution". Who is that guy? I don't recognise him. 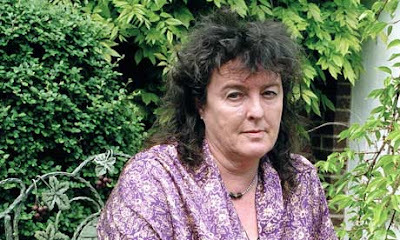 Carol Ann Duffy as Poet Laureate? How terribly risque! How politically correct can we get? A Scottish lesbian lecturer with a kid from working class Glasgow and a big ugly mush. The only trouble is that she is, in my view, a very ordinary poet who fails to move me very much or impress me with her predictable linguistic dexterity. Today many words have been said and written about her but below I give you one of her poems - after all this is why she has been appointed isn't it? Maybe not. I see little merit in such oily self-indulgence. Perhaps readers of this post could enlighten me. No Carol Ann, don't cross it out and say it is sad - just cross it out and chuck it in the bin! And another thing... why isn't she just simply Carol Duffy? What's with the pretentious insertion of Ann? Most of us have middle names but never use them in everyday communication. Did she have to separate herself from Carol Duffy the all-in wrestler or Carol Duffy the Gorbals pawnbroker? Myself, I'd have gone for Roger McGough who has in his own way moved me and has also done much to win young people over to poetry during his fifty years as a writer...even pre-dating the Merseyside scene of the early sixties in which he played his part - influencing to some small degree the lyrics of Lennon and McCartney. Today there was peace in the world. There is little to report. The financial markets remained stable. Not one single bullet was fired anywhere and the weather was calm with untroubled seas and sunshine everywhere. 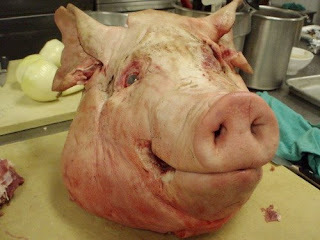 Swine flu figures didn’t alter and there were no hold ups on motorways. Nobody of any note died and there were no important anniversaries. In the world of sport, there were no transfer rumours or angry spats, no debates about Formula One’s future or Andy Murray’s prospects on the tennis court. No lions escaped from zoos and no Japanese fishing fleets went out on scientific research missions to kill whales and bring them back to Tokyo for eating. All Somalian pirates had a sick day. No politicians abused their status in order to claim dubious expenses and Jesus did not risk a second coming. 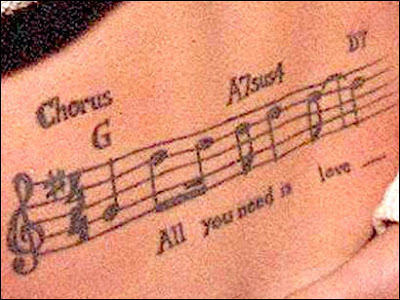 So as there is no news, here’s a little music…..